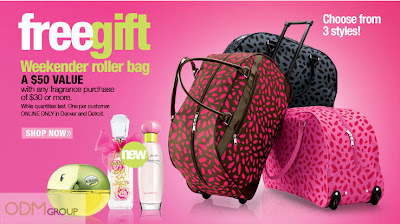 Ulta is now offering a custom roller bag worth $50 as their gift with purchase! Simply spend $30 or more worth of fragrance purchase at Ulta to be entitled. This promotion is only valid for online sales in Denver or Detroit. Hurry make your purchase soon before the promo gift runs out of stocks! Take a look at the attractive yet useful custom roller bag offered by Ulta! Go on a worry-free vacation with Lancôme’s custom cosmetics bag! Ralph Lauren Summer Holdall bag – GWP in the UK. Summer Scent Incentives – Bulgari Promotional Gift. Offering this gift with purchase can boost Ulta’s online sales. People would be encouraged to make purchases with Ulta in order to receive the free custom roller bag. The promotional gifts act as incentives to attract sales. People may choose to purchase Ulta’s fragrances instead of other stores’, so they could redeem this free weekender roller bag. They may even be wiling to top up their spending to be entitled. To add on, these custom roller bags have very high-perceived value. They are very useful and practical! People can store many items into this weekender roller bag. It is very convenient when people go travelling. They can carry this custom roller bags easily or even drag it on the wheels. This promotional gift is very durable and can be used for a very long time. Branding is vital in increasing brand awareness for your company! Ulta can brand these custom roller bags with their company logo on it. Company details can also be imprinted. When people use these custom roller bags, other people would be able to notice the brand name on it. This increases exposure of your company further when the roller bags are used overseas. Hence, your marketing gifts can simply act as a free walking advertisement for you! Hurry get started with your very own promotional gifts to boost your sales and recognition! Excellent tips for getting into promotional gifts services and sales. Nice post.